If you own a low-end chopper and looking to upgrade then DLC-10SY although isn’t the jack of all trades but its highly economical and at a justified price with features offered. 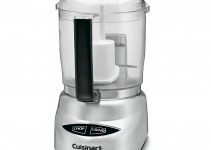 This 7 cup Cuisinart food processor white model promises to be at the sweet spot. It has almost all the feature of 14 cups in smaller packaging and is priced at a very affordable rate. It has the ability to operate with the flat lid so it can look even smaller on your kitchen top. Like the 14 cup Cuisinart food processors, this unit also has a big mouth feed tube. No pre-cutting is needed prior to a processing session. This is a newer model to DLC-10S and now ends at Y means there is no more part of the recall campaign and you are free to buy it. If you have the older machine blades still available they would work on this one. Its versatile and comes with a variety of blades and discs. The S-shaped blade does the chopping, mixing, kneading dough work. Two discs are also included in the package for shredding and slicing. You should consider buying the case of blades and discs to keep things organized and well arranged. Click to see Cuisinart food processor blade storage: Disc Holder or Blade + Disc Holder Box. As per the invoice and details, you should also receive the additional dough blade. In case you do not receive when you buy it then simply call Cuisinart support and have that sent to you. This bloke can do the chores of pureeing, kneading, emulsifying in addition to the mastered chopping, shredding and slicing. This Cuisinart food processor shredding disc will help you do a variety of tasks. And if you are wondering how to use Cuisinart food processor shredding disc then this video guide will help you. 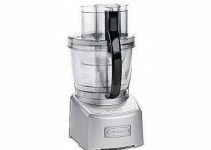 The video will also help you on how to assemble Cuisinart food processor. Craving for coleslaw then uses the shredder blade. The motor is powerful enough to knead dough for pizza and bread. It makes excellent Hummus and pesto. Shred cheese easily without facing the problem of the gap between outer rim and chute. Although it comes in the category of mid-size food processors but it can also do the work of an average Cuisinart mini food processor. If you are a fan of graham cracker crust or pie crust DLC-10SY can handle it as well. If your wife struggles with meatballs then you can gift her and she would grind chicken to make them. Fan of smoothies? then this Cuisinart food processor smoothies will make you love it more. There is a small hole in the small pusher by which you can emulsify and make mayonnaise by inserting fluid through it. The paddle changing feature enables you to give better control for ON-OFF Pulse function. The pulse function with few pushes will enable coarse finish to finer results with continuous on function. DLC-10SY competes with FP-8SV but former is the clear winner with heavier motor, longer Cuisinart food processor warranty, strong better build and no need of pre-cutting. The 7 cup bowl is quite wide with 6 inches diameter. 7 cup is a mid-sized Cuisinart food processor it can handle almost 3 cups of less dense and 5 cups higher density fluids. Dishwasher safe equipment is carefully engineered by Cuisinart. The provided spatula will help you clean the inner food build up. A big majority of reviewers have commented that the motor noise is quiet. Do not worry about the fact that you won’t be able to move it around. Its weight is wrongly mentioned here as 32 pounds, the machine weight 14 pounds only. The bowl plastic is vulnerable to process ice. Slicing hard cheese can damage the shredding cheese. Make sure you keep it in a freezer for 20-30 minutes before the shredding it. Some people have trouble setting up the machine but its always going to be learning the first time and you would be quicker the second time. 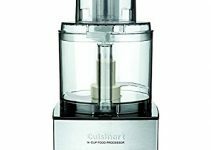 If you are searching for more Cuisinart 7 cup food processor reviews then see what these actual buyers have to say. Five years motor warranty which is quieter and three years unit warranty. DLC-10SY is a clear winner over its competitors. The current price is highly justified for the features provided. This creative unit is highly recommended from us. Go ahead and make your kitchen more powerful.